Jonathan Toews' season was as good as gold…and silver. If you asked Chicago's dynamic 22-year-old captain to craft a dream campaign before the puck dropped on the 2009-10 NHL season, Toews' checklist no doubt would have included a gold medal as a member of Team Canada's Olympic team and a Stanley Cup championship with the Blackhawks. Turns out, dreams do come true. Toews is still likely shaking his head days after the ‘Hawks celebrated their first Cup win since 1961, a six-game triumph over the Philadelphia Flyers, capped by Patrick Kane's thrilling overtime marker to seal the championship. Just how good of a season was it for Toews? The Winnipeg native won gold at the 2010 Winter Olympics, a tournament in which he was named Best Forward and took home the Conn Smythe Award as the NHL Playoff MVP. He also put his name in exclusive company. By winning the Cup, Toews passed Peter Forsberg as the youngest player to be inducted into the Triple Gold Club, an elite group of international players and coaches who have won an Olympic gold medal, a World Championship gold medal, and the Stanley Cup. “I think they're both special in their own way,” said Toews, of the Cup and Olympic victories. “Not to take any attention off of our team here right now, but to represent your own country, especially Canada, at the Olympics and your home country, that's something you'll probably never experience again in your lifetime as a hockey player. That's pretty cool. His success at such an early stage of his professional career is indeed impressive. But it's a hardly a surprise to those who have watched Toews' ascendancy from collegiate standout to big-league star. For two memorable campaigns, Toews made his mark as a member of the NCAA's North Dakota Fighting Sioux. Playing alongside fellow future NHLers such as Drew Stafford and Travis Zajac, Toews was a force for North Dakota from 2005-07. Toews is also one of the most popular players to have ever worn a Fighting Sioux jersey. “He has a presence about him that many people notice right away,” said Cary Eades, Associate Head Coach at North Dakota. “He's a special player who wants to get better. 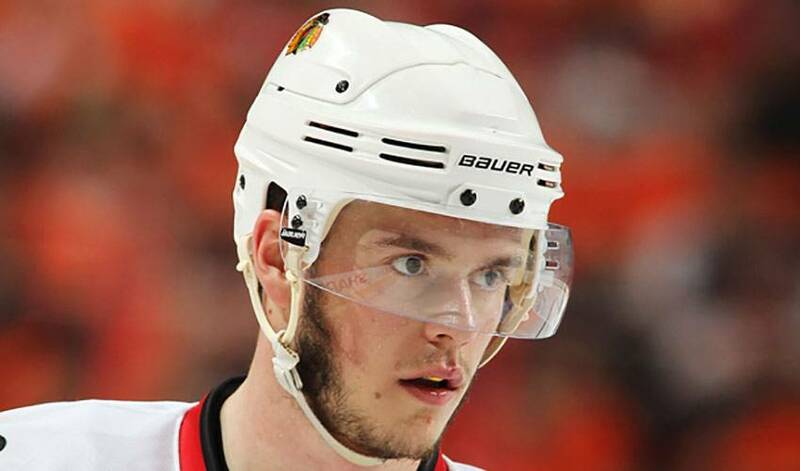 When someone asked him what he wants to achieve in his career, he said, ‘I just want to be the Jonathan Toews I can be.' He means it. There's nothing fake about him. And enough talent to stamp himself as one of the sport's top performers. Joel Quenneville, Chicago's head coach, certainly believes so. It's all in season's work for one of the league's most decorated young talents. Who can get the job done in the dot? If you happen to need a crucial faceoff win in the crunch, we offer up a handful of players who know how to stickhandle their way to success. With the 2016 World Cup of Hockey one year away, players from around the globe share their excitement . Jonathan Toews makes a wish come true for 4-year-old Nicholas Skretkowski from Milton, ON.